Practice Makes Perfect: For decades, Mid shot every Saturday and Sunday, whether for practice or in a match. Mid shot with four different clubs, each hosting their own match on a different weekend. He shot them all, as well as practicing the day before each match. That’s in addition to competing in Sanctioned and Registered matches. In the video above, Mid talks candidly about his storied career as a shooter and a shooting coach. He explains what it takes to win, and offers advice on how new shooters can improve their skill sets. Mid also talks about advancements in rifle hardware and bullet design. Mid also offers invaluable advice on how to dope the wind at Ben Avery. Last year, the 1000-yard Range at the Ben Avery Shooting Facility in Phoenix was officially dedicated as the “Middleton Tompkins Range”. Share the post "Legendary Shooter Mid Tompkins Profiled in Shooting Sports USA"
In the December 2013 issue of Shooting Sports USA, Barb Baird of Women’s Outdoor News sat down with Nancy Tompkins, one of the most accomplished shooters out there. A past World and National Champion, Nancy likes to reach out and touch targets at 1,000 yards with accurate rifles. She’s been competing in Palma (.308 caliber at 800, 900, and 1000 yards), Long Range (1000 yards) and Smallbore prone for 41 years. Thanks to her father, Nancy began competing in the seventh grade and now shares the love of shooting with her daughters Michelle and Sherri Gallagher, her husband Mid Tompkins, and her goddaughter, Danielle Makucevich. Nancy has competed on numerous international Palma teams, traveling from her home base in Prescott, Arizona. “There is nothing better than traveling, making new friends and competing with the best shooters in the world,” said Nancy. And she only shoots with the best equipment. Her 2013-vintage Palma rifle featured a McGee stock, Stolle Panda action, Krieger barrel, Anschütz trigger, Warner rear sight and a Right Sight (front sight). Her .22 LR Smallbore rifle sports an Anschütz action and trigger with a Hart barrel, McGee stock, Right Sight (front sight), and Warner rear sight. Nancy’s cat, Sierra, placed a toy mouse in one of her shooting stools a few years ago. Nancy now considers it her lucky charm. To learn more about Nancy’s recommended equipment, and glean great tips on Long Range marksmanship, get Nancy’s excellent book, Prone & Long Range Rifle Shooting. Nancy Tompkins has been shooting competitively for over 38 years. She has won the National Long Range Championships 5 times (1986, 1997, 1999, 2003, and 2015), the across the course National Highpower Championships (1998), the Metric Smallbore Nationals (2012) and the Fullbore Nationals (2012). She has also been the Wimbledon Cup winner (1993) and a 7-time Leech Cup winner (1995, 1997, 1999, 2003, 2005, 2011 and 2012). She has won both team and individual medals in the World Championships and has been on eight Palma Teams (as both a shooter and a coach). CLICK HERE for December 2013 SSUSA Issue with article about Nancy. Share the post "Nancy Tompkins, America’s ‘First Lady’ of Shooting"
The matriarch of American Long Range Shooting has done it again. The amazing Nancy Tompkins won the 2015 NRA Long Range Championship with an impressive performance. This marks the fifth time Nancy has won the LR Championship. This year’s LR match went down to the wire after many days of shooting. It all came down to X-Count, with two talented ladies tied for score. Shooting a 1242-58X over the multi-day competition, Nancy finished four Xs ahead of SSG Amanda Elsenboss (1242-54X). Both women dropped only 8 points out of 1250 possible. Amanda’s USAMU team-mate, SFC Brandon Green, finished third, one point back, at 1241-75X. SFC Green, the newly-crowned 2015 High Power National Champion, had high X-Count by a wide margin. CLICK HERE for Complete 2015 NRA Long Range High Power Rifle Championships RESULTS. This year’s Long Range Championships event was hugely popular, with 321 competitors on the match roster. Many familiar faces ranked among the Special Award winners. Our friends David Tubb (1241-69X) and Jim O’Connell (1235-66X) were High Senior and High Grand Senior, respectively. Tubb finished fourth overall, with the second-highest X-Count. There were also talented newcomers, such as High Junior Charlotte Flanagan, a young Kiwi from far-away New Zealand. Firing a 1236-40X, Charlotte is shooting at an extremely high level for someone so young. As Ken Littlefield noted: “It’s pretty impressive to come into Camp Perry for the first time and win the Junior Championship!” Charlotte could be formidable at the World Fullbore LR Championships slated for 3-9 August at Camp Perry. *The NRA Match bulletin lists Palma Rifle, but Nancy said she shot her “Any Rifle”. In this photo, Michelle Gallagher is missing … but someone had to take the photo. Here is Nancy with the Tompkins Trophy. And yes, if you are wondering, that trophy was donated, decades ago, by hubby Mid Tompkins as the top prize for the Long Range High Power Rifle competition. Share the post "Nancy Tompkins Wins 2015 NRA Long Range Championship"
UPDATE: On October 29th, at the Nationals, Derek Rodgers beat his own new record, with a 200-12X! Congratulations to Derek Rodgers for setting a new 1000-yard National Record with a score of 200-11X at the Arizona Long Range Regional in Phoenix. A past national F-Class Champion, Derek is a member of Team Sinclair and the U.S. National F-TR team. Derek’s rifle is built on a Kelbly action, using a Bartlein barrel and a McMillan stock. It is topped with a Nightforce Optics scope. His ammo was made using Berger bullets, Lapua brass and Hodgdon Powder. F-Class competition continues this week at the Ben Avery Shooting Facility in Phoenix Arizona this week. The 2014 F-Class National Championhip runs October 28 through November 2, 2014. The F-Class National Championship is a multi-day match comprising of all shots at 1000 yards. There will be a mix of individual and four person team matches. The competition consists of two different Divisions: F-Open and F-TR (Target Rifle). Each Division is made up of five different Categories: High Master, Master, Expert, Sharpshooter and Marksman. Share the post "Derek Rodgers Sets New 1000-Yard National F-TR Record"
The enhanced Second Edition will feature updates to the current chapters, more photos, plus an entirely new chapter on F-Class Shooting. The Second Edition will be issued with a hardback cover, for increased durability. Price isn’t set yet, but Nancy hopes to keep the price “under $40.00″. The book will be available from Sinclair Int’l and direct from Nancy via her website, RifleShootingbyNancy.com. 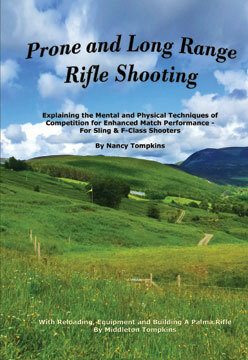 Author Profile: Nancy Tompkins has been shooting competitively for over 33 years. She has won the National Long Range Championship four times. Nancy was the first woman in history to win the National High Power Championship (a feat accomplished by only two ladies, the other being Nancy’s daughter Sherri Jo Gallagher). Nancy has also been the Wimbledon Cup winner, and a 5-time Leech Cup winner. She has won both team and individual medals in the World Palma Championships, and has been on 6 Palma Teams (as both a shooter and a coach). Share the post "Update on Nancy Tompkins Book: ETA is Early February"